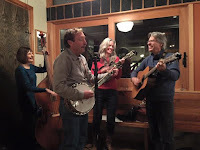 Mountain Honey is very excited to be sharing the stage with mandolin great John Reischman and his brother Steve with Sunny South on Sunday, February 26th at the Fremont Theater from 4pm to 7pm Happy Hour show. The Fremont Theater is a new venue in Portland that showcases the best bluegrass in town every Sunday. They are located at 2393 NE Fremont St. Put this show on your calendars. Not to be missed. NO COVER! Hope to see you there!